Instead of using bread in your stuffing, give rice a try. 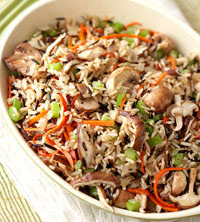 In this recipe, the chewy texture of wild rice is accented with brown rice, nutmeg, and mushrooms. Rinse wild rice in a strainer under cold water about 1 minute. In a 4-quart Dutch oven, combine wild rice, the 4 cups water, the brown rice, bouillon granules, salt, and nutmeg. Bring to boiling; reduce heat. Cover and simmer for 20 minutes. Stir in mushrooms, celery, and onion. Return to boiling; reduce heat to medium-low. Cover and cook about 25 minutes more or until rice is tender, stirring occasionally. Drain. Stir in carrots. Serve immediately. Makes 12 servings. Prepare Mushroom-Wild Rice Stuffing as directed; spoon into a 3-quart casserole. Cover and refrigerate for up to 24 hours. Bake, covered, in a 325 degree oven for 65 to 75 minutes or until heated through. This entry was posted on 2:02 AM and is filed under Rice . You can follow any responses to this entry through the RSS 2.0 feed. You can leave a response, or trackback from your own site.